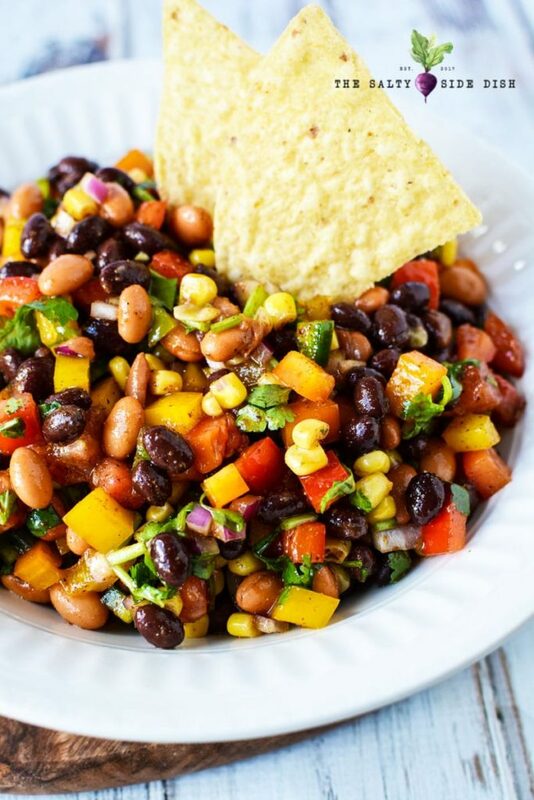 Cowboy Caviar, or Texas Caviar, is a healthy, flavorful, and easy dip recipe. 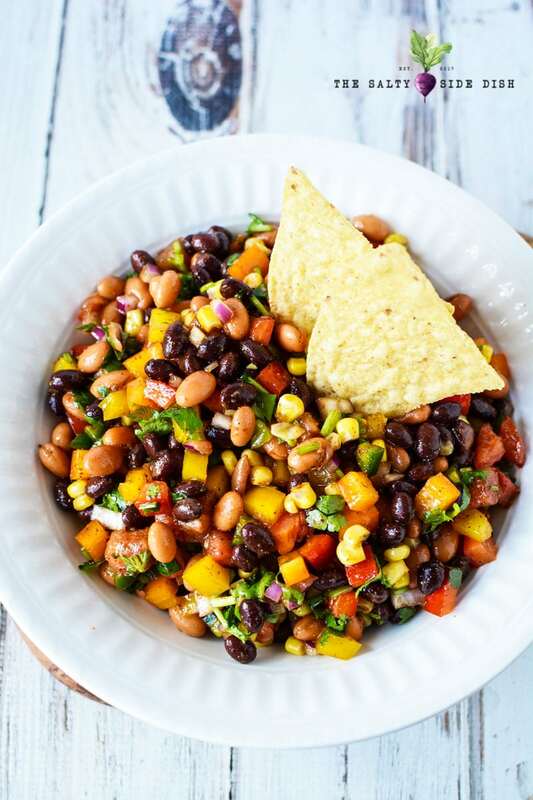 Full of diced veggies and a healthy serving of beans, its a can’t go wrong appetizer or side dish perfect for party crowds, big football games, or as a movie snack. I know this is a dip, but dang it all if I couldn’t eat this Mexican appetizer for a straight up MEAL. Sure, you can load Cowboy Caviar on chips all day long (topped w/ sour cream of course) but once it’s made, try throwing it on a taco or burrito. Seriously it’s THE best way to flavor UP your meals. We call it a side dish or an appetizer, but its also a main meal if you let it! This recipe makes 6 cups of dip, so you can do the math on how much you need. 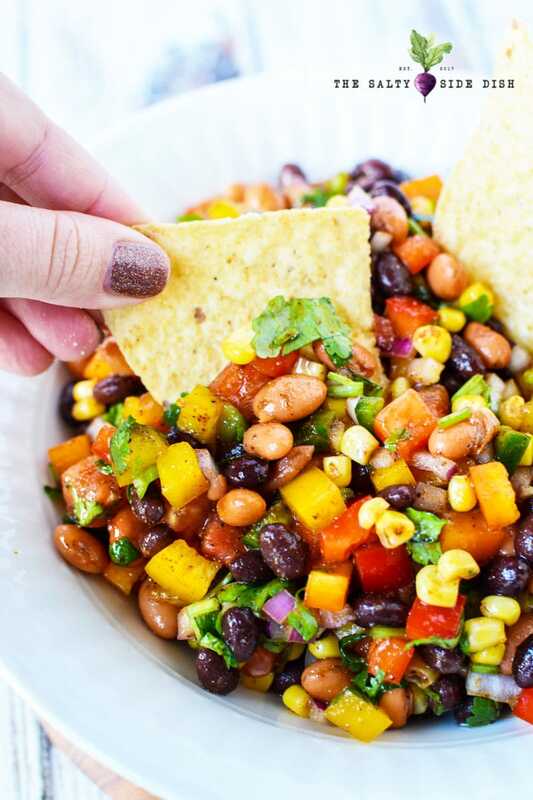 Texas caviar is a hearty dip is easy to make and with lots of good flavor as well. Full of veggies, I also think it’s pretty healthy dip considering! I’d recommend refrigerating your dip first for spicy flavors to mingle. 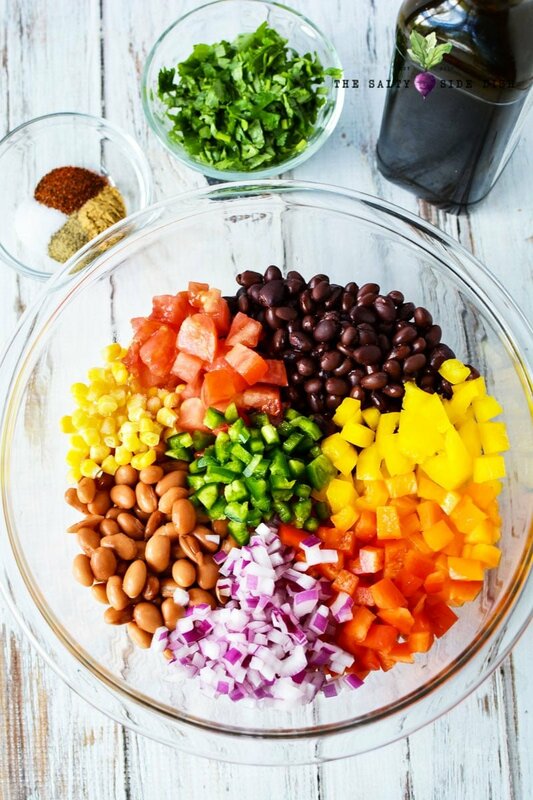 Add first 10 ingredients together in a large mixing bowl. Add seasoning (chili powder, cumin, salt and pepper) and mix well. 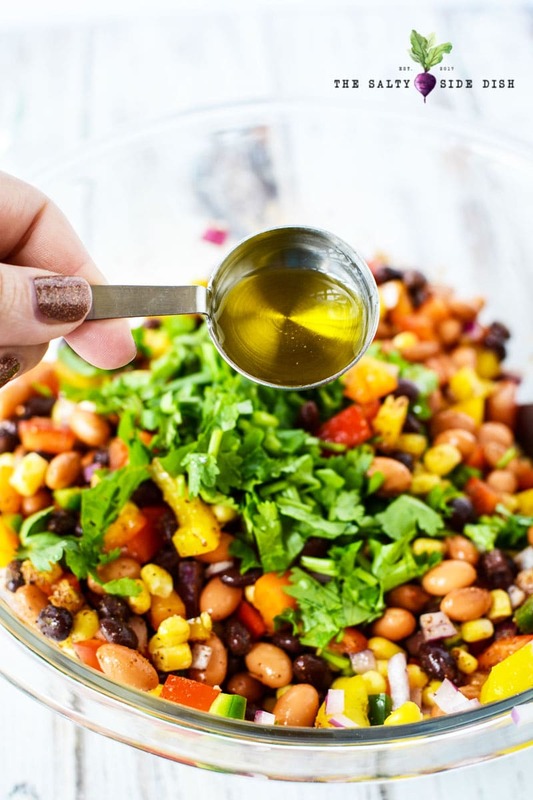 Drizzle olive oil and squeeze lime juice onto mixture (making a light tangy vinaigrette) and mix well to evenly coat. 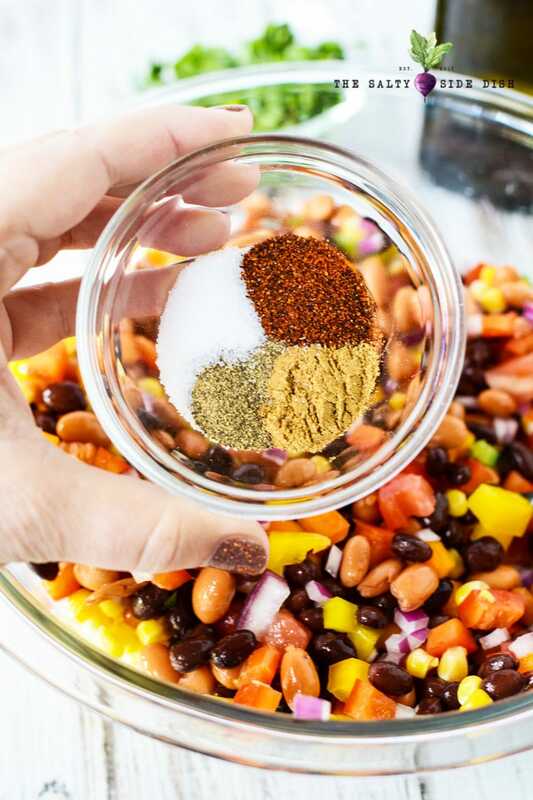 Refrigerate for 2-4 hours or overnight to let flavors mingle and marinate for the most bold flavors. Stir well before serving, adding an additional tablespoon of oil if necessary. Serve with tortilla chips, veggies, or crunchy crustini’s. 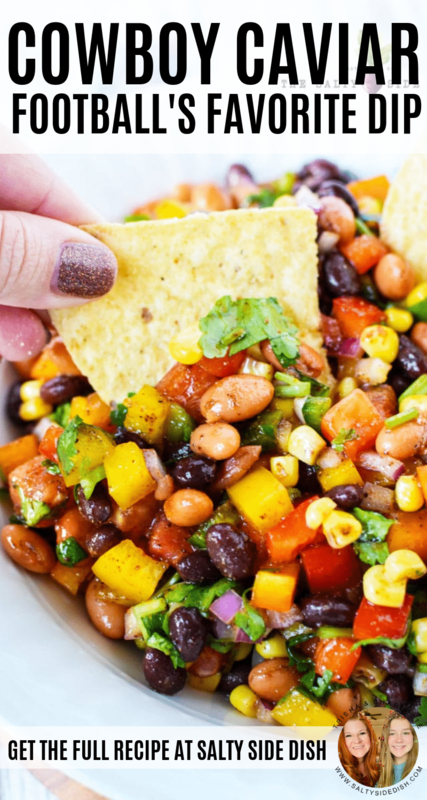 While this cowboy caviar recipe above has no avocado, you can easily add chunks of it right before serving. Because avocado can get brown and freak everyone out, its best left to the side till right before you put it out. You can also serve this caviar dip right in a 7 layer salad and it pairs well with pico and queso for a full Mexican Side Dish spread. 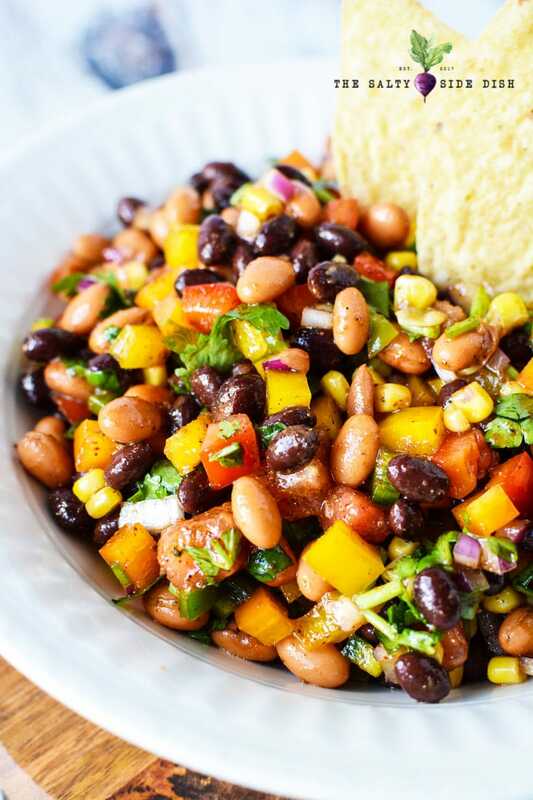 Cowboy Caviar, or Texas Caviar, is a healthy, flavorful, and easy dip recipe. 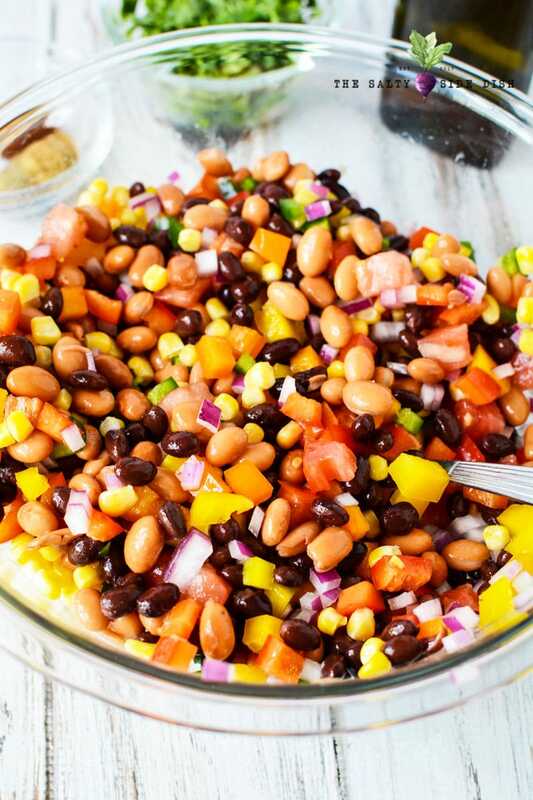 Full of diced veggies and a healthy serving of beans, its a can't go wrong appetizer or side dish perfect for party crowds, big football games, or as a movie snack. Add first 10 ingredients together in a large mixing bowl. Mix well. Add seasoning (chili powder, cumin, salt and pepper) and mix well. Drizzle olive oil and squeeze lime juice onto mixture and mix well to evenly coat. Refrigerate for 2-4 hours or overnight to let flavors mingle. Stir well before serving, adding an additional tablespoon of oil if necessary.